Dear collegues we will glad to see you at 19th World Congress of International Society of Cryosurgery (ISC2017) in Kaunas. 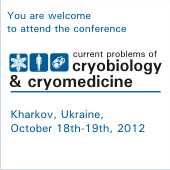 Scientific conference "Current problems of cryobiology and cryomedicine" to be held in Kharkov (Ukraine) at the Institute for Problems of Cryobiology and Cryomedicine of the National Academy of Sciences of Ukraine on October 18-19, 2012. - Fundamental and applied aspects of cold exposure in humans and animals; responses of biological objects to low temperatures; cold adaptation of animals and plants. This list is not exhaustive. The Organizing Committee would evaluate if provided materials comply the conference subject. Within the frames of the conference there are planed the presentation of the companies producing specialized equipment for scientific research, medicines, chemical reagents etc., exhibition and workshop on cryobiological and cryomedical devices, as well as the discussion of bioethical issues of the experiments in cryobiology and cryomedicine. Working languages: English, Russian, Ukrainian. Deadline for registration and abstract submission is June 30, 2012. The details about the conference, instruction for the abstracts' submission, as well as the registration is available through the conference website. The conference proceedings will be published in "Problems of Cryobiology" journal. Institute for Problems of Cryobiology & Cryomedicine of the National Academy of Sciences of the Ukraine holds the annual conference of young scientists "Cold in Biology and Medicine". The conference is intended to present the works of work of the post-graduate students and young scientists from different biological institutions, as well as university students. Traditionally the conference is held during 2 days mutually with the UNESCO Chair in Cryobiology. The abstracts of the reports are published in the "Problems of Cryobiology" journal. Since 2003 all the presented works are taking part in competition judged by Special Commission of honarable scientists of the Institute.